MitoPlates provide a powerful new research tool by allowing scientists to run preconfigured sets of 96 mitochondrial function assays in one experiment. Mitochondria can be interrogated and characterized in novel ways, looking at rates of substrate metabolism, sensitivity to drugs and other chemicals, and effects of mutations in mitochondria-related genes. Mitochondrial function is assayed by measuring the rates of electron flow into and through the electron transport chain from metabolic substrates that produce NAD(P)H or FADH2 such as L-malate, succinate, pyruvate, etc. 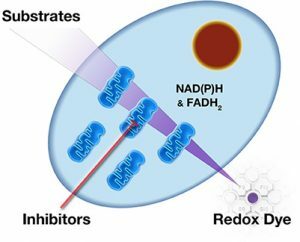 Each substrate follows a different route, using different transporters to enter the mitochondria and different dehydrogenases to produce NAD(P)H or FADH2, The electrons travel from the beginning (complex 1 or 2) to the distal portion of the electron transport chain where a tetrazolium redox dye (MC) acts as a terminal electron acceptor that turns purple upon reduction. Additional MitoPlate assays probe the sensitivity of the mitochondria to a set of 22 diverse inhibitors. STEP 1: Prepare and pipet assay mixture containing cell permeabilizing buffer and redox dye into appropriate wells. STEP 2: Start the assays by adding 2x cell suspension to all wells. STEP 3: Load the MicroPlate into the OmniLog® for kinetic reading of the rate of purple color formation. The OmniLog Instrument and associated software allows for real-time recording and kinetic analysis of electron flow rates. The OmniLog can simultaneously incubate and read up to 50 MitoPlates and provides powerful analysis tools to get the most from your experimental data. Not Included: Saponin permeabilizing solution and substrate solutions for MitoPlate I-1. Please review Instructions for Use prior to ordering.